Dear Apple and AT&T: I have had enough of this. Tell me, why don't we have videochat on the iPhone, you assclowns? Whatever excuse you may have, I'm here to destroy it. This morning, the latest Fring update brought videochat to the iPhone. It only works in one direction, from a computer to your iPhone. It uses Wi-Fi instead of the 3G connection, even while 3G is capable of supporting videoconferencing (in fact, it was one of its major selling points, back in the day of its introduction). 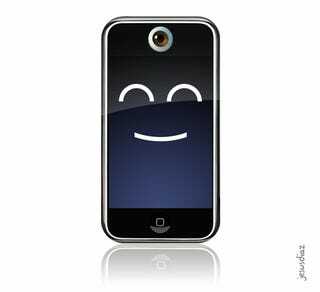 The only reason for not having bi-directional chat is simple: The iPhone doesn't have a front camera. The main thing is that it works. A third-party has created a videoconferencing app for the iPhone that communicates with desktop computers, just using Apple's standard iPhone programming toolbox. The question now is: If it's that easy, why don't we have a camera and iChat AV on the iPhone? Could it be because AT&T is fearing that videoconferencing on the iPhone would bring their already overloaded 3G network to a total collapse? That's a valid reason. But if that's the case, just enable the videoconferencing under Wi-Fi, and be done with it. Maybe the iPhone doesn't have enough processing power to do bidirectional videochat? Nonsense. The processor in the iPhone is plenty fast to handle simultaneous H.264 encoding and decoding for videoconferencing applications. In fact, the iPhone 3GS' PowerVR SGX processor has dedicated pipes to encode and decode H.264 in real time. And even Apple highlights the use of H.264 for videoconferencing applications in other 3G mobile devices, most of them a lot less capable than the iPhone. Perhaps the VGA camera required to capture the video is too expensive or too big? That doesn't make any sense either. Not only do other phones have these cameras, but the latest generation is so tiny and inexpensive that I wouldn't be surprised if they gave one away integrated in every Corn Flakes box soon. If there's no technical reason for not having videoconference in the iPhone, then why oh why Apple doesn't give us an iChat AV client and an iPhone that doesn't require an stupid contraption to use it? After all, they were the first company to push videoconferencing across their whole product line, and they keep working on it actively. The latest generation of iChat AV—rolled out with Snow Leopard—has more efficient codecs than the previous version. My only guess: They just want to milk the hell out of their user base. They know their game, these Cupertino boys and girls. They know they have the market by the balls. They know they can keep churning out marginal upgrades because, like Tim Cook said: "frankly, I think people are still just trying to catch up with the first iPhone 2 years ago." And people will keep sinking dollars in the marginal upgrades like there's no tomorrow, as shown by the iPhone 3GS. Why release an iPhone with AV conferencing now when they can hold it for a little longer, as they wait for the rest of the market to catch up? Exactly: There's no need. And that's why we will have to wait. Wait until they smell that Google is about to release a phone that supports Gtalk with videoconferencing. Or until whenever they have it planned in their roadmap. Yes, that private roadmap that already has three or four generations of this thing ready to launch. In other words: Prepare to wait, and keep sucking hard on the Apple Kool-aid, because this is not happening until they feel a real threat from someone else.